Press museum is a small museum which specializes in the history of the newspaper and magazine publishing. 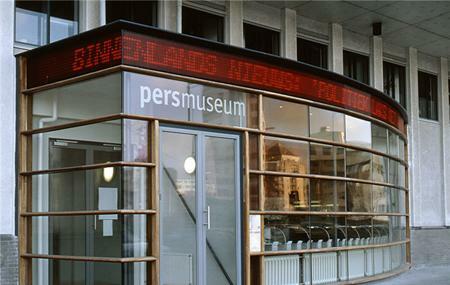 The museum offers a look into the history of the press in the Netherlands. The museum is modern in its fashion and has a well-documented exhibit that shows the whole history of the press in Netherland. The museum sees a lot of tourists all the year round due to its specialized nature and great ambience. Take a bus from Amsterdam, Veelaan or Amsterdam, Borneolaan. Take a tram from Amsterdam, C. van Eesterenlaan. How popular is Press Museum? People normally club together Carla Koch, Gallery and Amsterdam Arena while planning their visit to Press Museum. A speciality museum and everything is in Dutch, but it is far more interesting to the general public than you may think. Informatief museum met interessante exposities, onder meer over Simon Carmiggelt, politiek tekenaars zoals Peter van Straaten en binnenkort Geert Wilders als mediafenomeen. Een must voor iedereen die geinteresseerd is in de Nederlandse journalistiek en haar geschiedenis. Leuke expo, maar natuurlijk wel klein museumpje.